This is the day of the trip that we were least looking forward to: 400 miles across Nevada, with presumably little to see along the way. Before checking out from the Whitney Peak Hotel, we decided to visit the second floor, where a notable rock climbing facility is located. Coming out of the elevator, we were there: many rock climbing walls that took up most of the second floor, except for a fitness center and small gift shop. 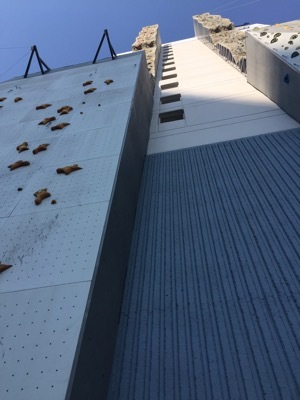 Stepping onto the balcony, we got a better look at the outdoor rock climbing facility we saw in last night’s darkness: two large walls perhaps 50 feet tall, above which was a landing and two more narrow walls extending up several more floors. Climbing any of those would be an impressive achievement. After checking out, we drove a short distance east to Sparks, and had breakfast at a Starbucks there. Then after filling up the tank we began our long drive. 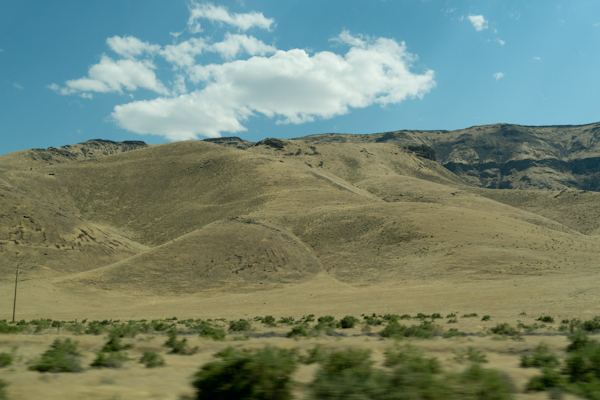 The first part of the drive, along the Truckee River, was quite scenic, much more so than I had expected (or remembered). Soon after leaving town, the speed limit increased to 80 mph and the surroundings changed to drier brush. Although the road seemed to be in excellent condition, a couple of road paving operations were underway that narrowed the road to a single lane and a speed limit of 55, which somewhat countered the benefit of the 80 mph sections. We stopped for lunch at a Subway in Winnemucca. We continued to Elko for our afternoon ice cream break (a tradition on some of our road trips), and then on through picturesque clouds and a few showers to Wendover, Utah, our stop for the night. Wendover is on the border between Nevada and Utah, with casinos on the Nevada side and considerably more staid surroundings on the Utah side. The Utah border is also the time zone boundary, causing us to “lose” an hour. We took a short stroll back into Nevada, then returned to Utah for dinner at a nearby cafe.